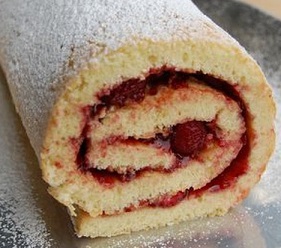 There aren’t that many ingredients for a jellyroll, a sweet, exceedingly simple desert. Just your basic flour, eggs and sugar, a roll call of baking staples. The flavor of jelly used as the filling can be switched up but you can’t go messing with the recipe and still have it come out right. If you misread the directions and substitute the amount of sugar for the amount of salt used it’s not going to taste the same, or probably be edible at all for that matter. Songs of course aren’t like food, there’s no set instructions for how to make a song come out right, but that doesn’t mean there aren’t certain flavors that compliment one another and others that don’t mix well at all. Sometimes though artists throw in all of the flavors they can think of and hope the taste appeals to somebody. Among the more dubious inclusions on the roster of 1940’s rock artists is L.C. Williams, a drummer turned singer who scored in the summer with Ethel Mae, a pure blues song that was far removed from rock ‘n’ roll. Yet the flip side of that record was the hell bent rocker Shout Baby Shout, which was as vibrant and modern sounding as anything you could find. Other artists could vary their approach based on the material but very rarely did they almost seem to be two entirely separate and distinct artists like this kid. The still-teenaged Williams could sound twice his age when performing in the country blues style of his mentor, country bluesman Lightnin’ Hopkins, yet when he cut high octane rock songs he’d shed those added years effortlessly. Once Williams scored out of the box with the blues side of his persona his fate was cast and it’d be that field he’d stick to most consistently, but he’d still dabble enough in rock to make you wonder what would’ve happened if the other side of that record had been the one to have connected with audiences. Would he have then dropped the blues and headed into rock ‘n’ roll with no reservations? It’s hard to tell. Normally that’d be the expectation of course, as the tendency in music, whether dictated by your record label or your own commercial instincts, is to follow the sales, not necessarily your own artistic preferences. But Williams seemed so indebted to Hopkins that maybe there was nothing that could’ve convinced him to stick more closely to rock, even as its commercial prospects soon outraced his increasingly archaic brand of country blues. But here the question is still ostensibly up in the air, even if we’d already have a pretty good idea where he’d throw his allegiance to once the blues side of his last record hit. But the odd thing about Jelly Roll is that it’s not strongly connected to either rock or blues, but rather is such a hybrid of all types of music, jazz and even pop included, that it becomes something of a fascinating glimpse of the black music market just before the halfway point in the Twentieth Century, and thus something we couldn’t pass up the opportunity to examine more closely, if only to put all of this in context heading forward. The first sounds we hear are horns, but while the musicians are familiar enough to us – the studio band known as Conney’s Combo (a/k/a The Hep-Cats when backing Goree Carter) who were led by Conrad Johnson, featuring he and Sam Williams on saxes – the sound they’re delivering here seems as though it’s emanating from a door to yesterday that’s about to be closed forever. It’s not completely outmoded in music circles, although for rock it’s certainly on the edge of being past its prime, but it has a hazy wistfulness to its textures that are the remnants of the war years which by this point seem another lifetime ago, even though it was just five or six years in the rearview mirror. The mood it creates though is oddly reassuring, almost comforting in a way as they drone on in mild harmony, almost eking out some soulfulness in spite of their bleak tone. Backed by piano triplets initially and some quirky drumming, Williams comes along in a voice that once again gives absolutely no indication that he was a teenager… or had EVER been one for that matter. But because it’s not a blues song he also doesn’t sound like he has emphysema and just weeks to live either as he often did when delving into that style. Instead on Jelly Roll he sort of floats along with a ghostly tone, much higher pitched than we’ve heard him before, but again it’s somehow fitting for the song. He sounds like he’s anguished, almost in pain, but the emotional kind rather than suffering with any physical ailment. He holds and bends and forcibly twists notes in a way that adds gravity to the sentiments and keeps you off balance in the process. It’s as if he’s wringing the emotion from his soul and each twist of the rag elicits a different response. Yet is any of this actually appropriate for the subject matter? Regular readers on this site no doubt instantly recalled an earlier record with an almost identical title by Johnny Otis back in June 1949… (humor me and say you remember). The Jelly Roll used the more salacious street terminology for the topic, that of a girl’s private desert offering for privileged diners… (yeah, I think that’ll pass the censors). Though the actual food it was named after wasn’t exactly obscure it’s hardly the type of subject matter for TWO records in a five month period. But the raunchier alternative meaning, the one both of these records were hoping would draw in curious and… umm… “hungry” fellas who’d gone awhile without a bite to eat (do your best, censors!) had certain topical suggestiveness that was required for the payoff. Without that then the songs would disappoint and presumably not draw much interest. Williams doesn’t deliver in this regard… doesn’t really even try either… the closest he gets to anything off-color is when he describes his girls lips as cherry red, but when he then moves to her eyes on the next line you know he was focusing on her from the neck up, not the waist down and your curiosity wanes as a result. Because of this there’s really nothing to recommend it lyrically. The praise and the pleas he offers are both rudimentary and rather bland, certainly nothing to stick in your mind, nothing that will draw a smile or open your eyes in either off-color astonishment or because it reveals anything of note about the girl he’s speaking to. In fact, though he certainly sounds committed to her, she’s basically irrelevant to the entire record other than acting as focal point for his singing. She’s not flesh and blood as much as she is just an vacant image, a stand-in for the audience to project their own longing onto. Without any stake in the outcome of his situation it’s left to his technique to try and win us over and here he does quite well, even if the way he does it is pretty alien to rock vocals, as his warbling seems out of another time, another place, another genre, but I’ll be damned if I can pin down what time, what place OR what genre. He’s not rhythmic enough in his singing to make for an easy comparison to the majority of rock acts to date who keep things jumping with their enthusiasm. But he’s also not emotional enough to compete with the likes of the best of the gospel-bred rockers like Andrew Tibbs and Roy Brown on ballads, nor soulful enough to match lines with the likes of Amos Milburn or his ilk who always seem as though something unstated is stirring under the surface of the lyrics. So we look elsewhere. The blues would be the next stop naturally, but this is far too uptown for his brand of dusty country blues, and too serene to fit in well with the harsher urban blues that was taking hold around this time. It’d be farcical to look to make a comparison to bandstand crooners like Nat “King” Cole who is far out of his league, as are more vibrant shouters like Jimmy Rushing. He doesn’t have the slack quality in his delivery that cocktail blues star Charles Brown employed, nor the sly wit of Louis Jordan. The classier vocalists, either those fronting a band like Trevor Bacon with Lucky Millinder, solo star Billy Eckstine or Bill Kenny of The Ink Spots, are well-removed from Williams as well. Who’s left? Eddie “Cleanhead” Vinson perhaps, though that’s admittedly a stretch. Old friend Cecil Gant who dabbled in rock had a ballad delivery which has some of the same halting qualities that Williams shows here might be your best bet, but the vastly different set of vocal chords they possess makes a strict comparison almost impossible. By the end of the song we’re no closer to being able to get a firm grasp on Williams than we were at the beginning. Whatever the source and wherever his influences stemmed from in how he delivers Jelly Roll, Williams manages to connect in a basic elemental way that’s not easily explained. It’s sincere, if a bit uncertain, but endearing enough even if it isn’t the best fit in any corner of the rock landscape. The band that could easily pick up the slack in that regard don’t seem to know quite what to make of him either. They’re diligent in their letting Williams lead them, keeping their work in the slow lane for much of it, content to fill in a few cracks with a drum kick here, a piano lick there, but not until Johnson takes a decent solo on sax does anything about it really capture your attention. He stretches out on his alto, dropping down at times as low as he dares, but while intriguing, even oddly mesmerizing to a point, it doesn’t transform the song. Instead it almost reinforces the same unsteady, haunting vibe that hangs over it all right to the end. 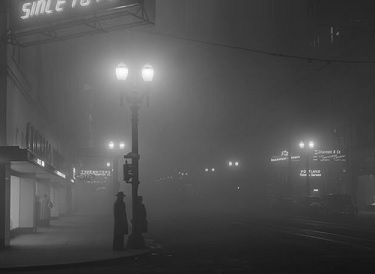 In many ways this is the musical equivalent of a foggy night out on the town, where you’re happy to be out and soaking up the atmosphere, but because of the limited vision you have any time you step out onto the boulevard you’re just a little bit unfocused. Sounds float out of each bar or club along the way, but you’re never quite sure which looks most promising and so you hesitate before entering them all. The people you pass are audible in their conversation but their revelry is private because you can never get a sense of who they are and what they’re carrying on about. By the time the bars close you’re no worse for the wear, your pockets aren’t quite empty and you’re in no rush to get home, but you also aren’t exactly in the mood to keep looking for action. So it is with L. C. Williams, who in Jelly Roll gives us something fairly nice, certainly interesting, but nothing we ever feel we can get a firm grip on. His versatility compared to what we’ve heard in the past is admirable for sure, but slightly maddening at the same time. He’s like a singing sphinx, crossing you up with a stylistic riddle that gets more vexing the harder you try and solve its mystery. Maybe it’s best then not to try and just let the sounds drift in one ear and out the other as you wait for the fog to lift and head someplace more predictable, more reliable and more elemental than what he shows here. 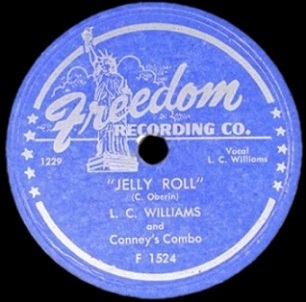 Leave a reply on "L. C. Williams: “Jelly Roll”"